While there are many kitchen cabinet styles on the market today, there are some that are timeless classics. Take white Shaker kitchen cabinets, for example. They match a wide variety of decors, styles and layouts, featuring a clean, simple look that is endearing in any kitchen. So what exactly is the Shaker style? Well, it originates with the Colonial people of the late 18th century. Those early colonials and settlers were simple folk and didn’t embellish their furniture with extra flourishes or accents. Their designs were rooted in simplicity, preferring to focus more on function than decoration. Featuring clean, sharp lines and sturdy construction, cabinets made during the Colonial era were designed to last for years in unforgiving environments. That’s because there were wood stoves, intense heat and cold winters that all negatively impacted the integrity of wood. Their cabinets had to be built to last. Today’s models, of course, are more energy efficient and stylish yet they are still quite durable. 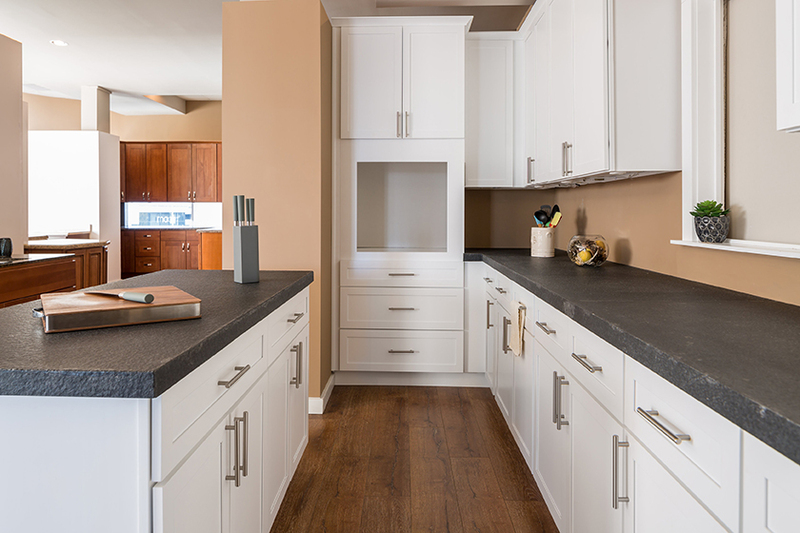 Check out some reasons why white Shaker kitchen cabinets are ideal for your home. It’s easy to pair this style with either a modern or classical décor, lending a versatile aspect that many homeowners appreciate. They look best when coupled with solid woods like cherry, hickory and maple, typically left in their original natural wood hue or stained to match the overall home décor. Because they are white, Shaker kitchen cabinets have a tendency to brighten up a room. With more natural light and light-colored cabinets, even a small kitchen seems larger and more inviting. White historically brightens up any room, especially vital in the kitchen. The color is clean and fresh, triggering healthy appetites and high energy levels. If you like the minimalist look, you’ll love white Shaker kitchen cabinets due to their sharp lines and lack of flourishes such as rail frames and flat paneled doors. If you are the type of person who changes their style every few years, these cabinets are perfect because they’re timeless and you don’t have to change out the style whenever you get a whim. Those cabinets can stay put over time, while you change the design around them. White Shaker kitchen cabinets are a wise choice if you are a homeowner who may be selling in the near future. Because of their simplicity of design, they appeal to a wider base of prospective buyers. Thus, it’s no secret that the demand for white Shaker kitchen cabinets is on the rise. Not only are they simple to operate and clean, they also offer a certain level of poise and sophistication. Investing in a kitchen renovation that includes white Shaker cabinets can improve your home’s value by up to $50,000, depending on how much work you put into it. Even a boost of $15,000, which is typical, is a great side effect of a kitchen remodel. Don’t spend a fortune on kitchen cabinets. Buy them at the wholesale level and install them yourself to save cash for more expensive parts of your renovation, such as countertops, appliances and flooring. Contact Summit Cabinets today at 909-980-0700 or fill out our form for a free kitchen design.